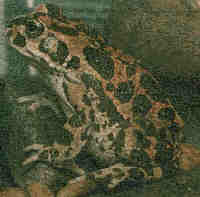 Slender greenish to brownish frog with dark spots which are usually edged with a lighter color. It has a light stripe along its upper jaw and tends to grow to be a little over 3 inches in length. These frogs need to hibernate for about 3 months: at 37-39�F (3-4�C). Breeding is most likely to happen in outdoor enclosures like backyard ponds. These guys can be found in all kinds of sites, from dirty cloudy marshlands to freshwater lakes. They come mostly from Southern Canada and the northern half of the U.S. and have been classified into at least six distinct species (that Ive heard of anyway.) All leopard frogs, however, can be treated alike. Mostly nocturnal creatures, these guys tend to take cover in the water when startled. There are similar, related species of frogs that has similar care such as the Southern Leopard frog Rana sphenocephala. There is also, however, one frog that looks deceptively similar called the Pickerel Frog or Rana palustris. The Leopard Frog and the Pickerel Frog can be distinguished by the arrangement of their spots. The spots of the Pickerel Frog are almost square in pattern, while the Leopard Frog's spots are very irregular in shape and pattern. The Pickerel frog's beautiful squarish dark markings on its tannish back it looks very similar (though possibly somewhat more handsome) to most leopard frogs, with the one crucial difference being that they have somewhat toxic skin, and should therefore be housed alone as they can poison other frogs. This is a picture of Tom Buchanan's bufo regularis Leopard Toad , gender unknown, estimated age 3-4 yrs. Photo taken by Melvyn Esson of Flash! photography. Learn how Leopard Frogs have adapted for Protection in this Weird Frog Fact Page. Find out about some of the dangers Leopard Frogs are facing in Some Threatened Species section in the Save Our Frogs pages!